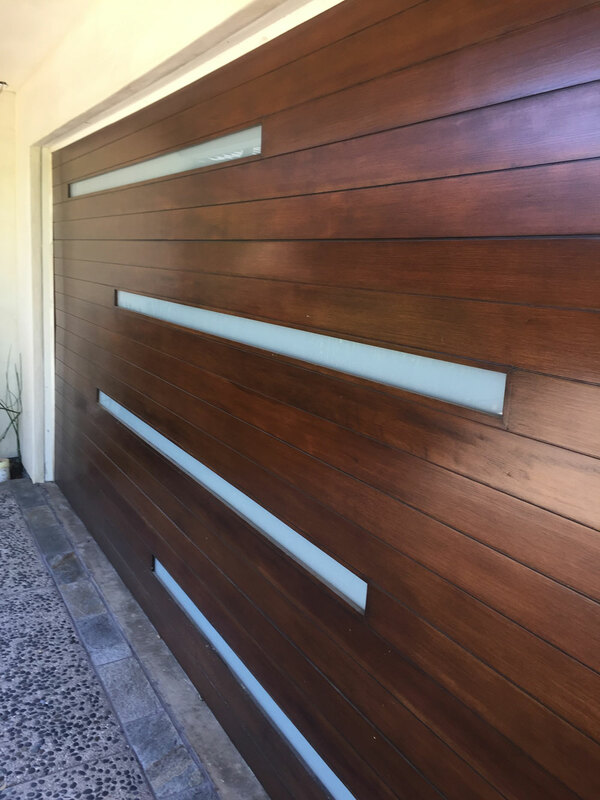 Garage Doors: Thoughts and Strategies - Kurt Krueger Architects, Inc.
Let’s face it, garage doors serve a utilitarian function. But for many architects and homeowners, the garage door is one of the least glamorous aspects of a home—-and for good reason. Most garage doors are simply ugly and uninspired. 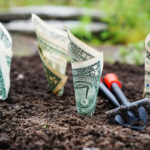 More often than not, they can detract from the overall design of the home. Too much emphasis on the garage doors can even backfire and make the garage the focal point. Single, and especially double wide, garage doors are often the largest element on the front facade. For many, the first thought is to hide the door: place it around the corner so that it is not so prominent, or better yet not have one at all and just have an open carport. While carports might work in places like Southern California, your car can be exposed to quite a bit of dust, as well as being less secure. In colder environments, this is simply impractical. And in a renovation, it might not be possible to relocate the garage doors, so coming up with practical design ideas to make the garage doors an integrated part of the overall house design is essential. 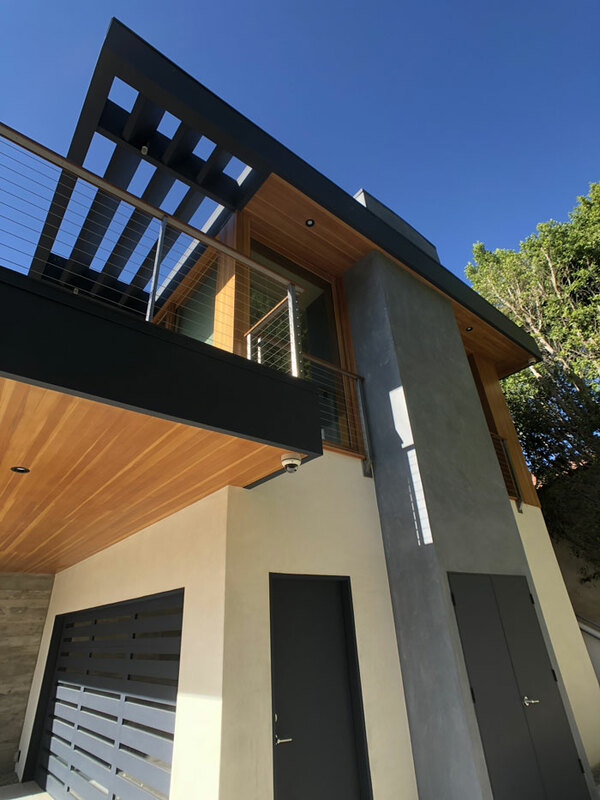 While there are many new technologies that can do amazing things with garage doors, we decided to highlight below a few of our projects that utilized standard garage door systems with design solutions that are not so typical. The Westgate Residence was a major remodel of an existing mid-century home. The garage already had some height limitations, so a standard roll-up garage door would have been a problem because the track for the garage door would have sat so low that when you opened the door into the house, you would be able to see the track sitting lower than the door header. Worse, tall people may even have even hit their head on it. See the Westgate Residence in our Portfolio. At the Sunset Residence, we did use the standard 4-panel door track system, but added some design flair. Sunset is also a whole house renovation and in addition to the interior changes, we were completely re-landscaping both the front and rear yards to change the overall design style of the home. Leading up to the home, we designed offset stone inlays within the pebble concrete driveway. This created a pattern of movement up to the home. We decided to replicated the same lines in the garage door using offset horizontal bands. We frosted the glass for additional privacy. 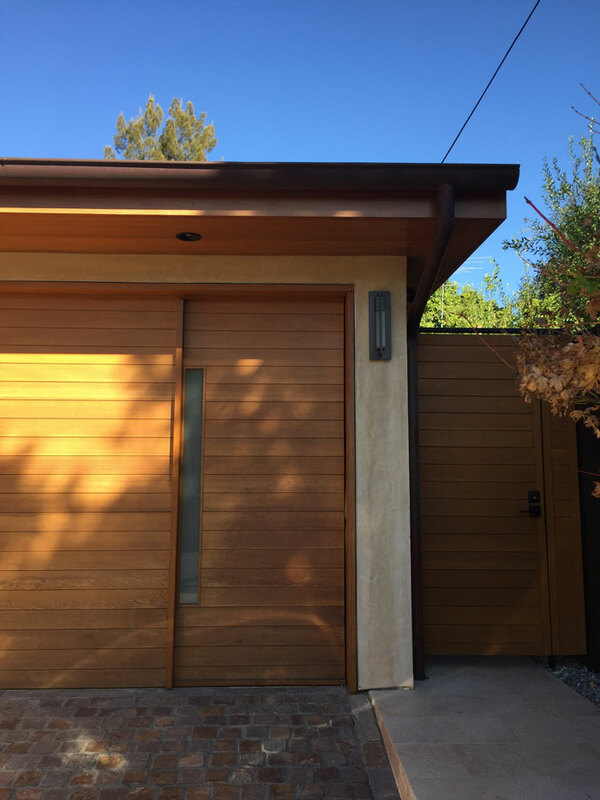 This project used many natural materials as key elements of the design and for the garage door, we used walnut tongue & groove panels. The panels were finished on site by hand. In the evening, when the garage light is shining through the frosted glass panels, it creates an interesting glow along the driveway and entry approach. See the Sunset Residence in our Portfolio. Detail view of garage door at Benedict Canyon Residence. The garage door at Benedict Canyon was conceived by considering the architectural gestures of the house and alluding in a similar, but unique way. The metal trellis covering the second floor deck above is divided into three parts, each subdivided by the louvers of the trellis. This same three-part sub-division is reflected in the garage door where we designed a painted flush wood panel with small incisions of clear glass. Just down the driveway, this same pattern will be repeated at the entry driveway gate. Where there was glass at the garage, at the gate there will be a void to create better visibility of pets or children on the opposite side. See the Benedict Canyon Residence in our Portfolio. Making the garage door compliment the rest of the architecture of the home is key to an overall cohesive design. Whether you are designing a contemporary home or doing a renovation of a historic home, consider the size and character of the building to make the garage door an integrated component of the facade so that it becomes less prominent and is additive to the overall aesthetic.